This is one of those recipes that might stop someone dead in their tracks. As soon as they see the words "baby octopus," they turn and run the other direction (or close their browser tab). And this is totally understandable. Octopus — and baby octopus, for that matter — has yet to enter the mainstream food index. 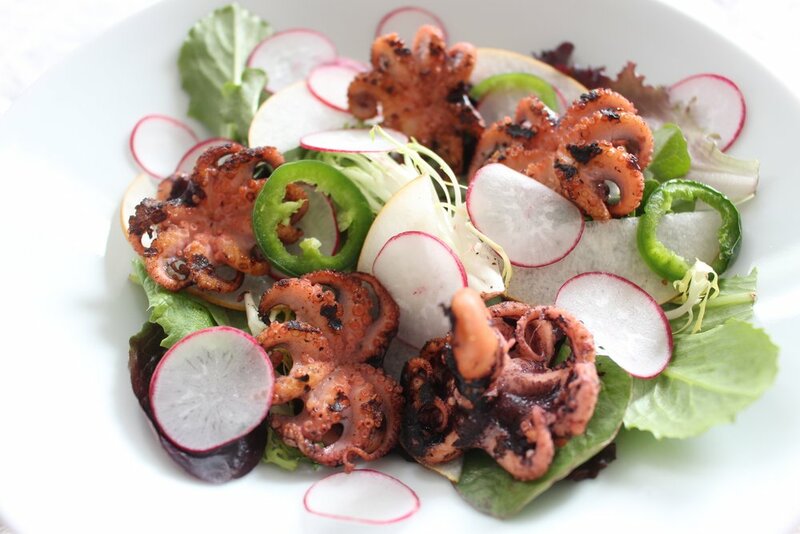 Unlike squid, which has become a popular appetizer in countless restaurants across the country, thanks to its friendly ring-like form and deep-frying, octopus remains esoteric, foreign, and, well, jarringly anatomic. But why are we food adventurists here if we don't try and open others' eyes to new foods and their possibilities? 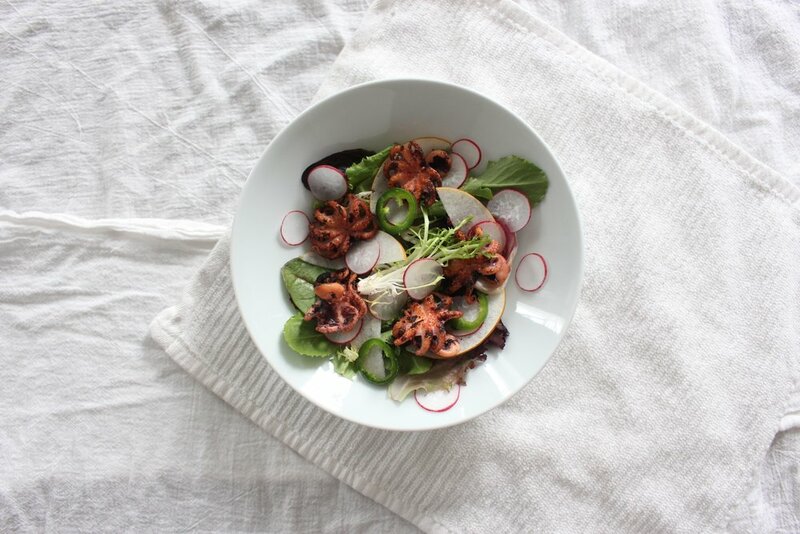 My mission now, with this blog entry, is to make a convincing case for not only trying baby octopus, but trying your hand at making it. For those of you who've never tried it, octopus, when prepared right, can be incredibly tender and full of flavor (baby octopus is even more tender). For those of you who've never made it, it's similar to many other meats — braising it makes it tender and then grilling it makes it crispy and caramelized. For this dish, I marinated the baby octopuses overnight in lemon juice, paprika, cayenne, cumin, chili powder, and jalapeño, but you can just marinate yours for a few hours and they should be just as flavorful. Then, right before serving, I threw them onto my grill pan until they were caramelized to achieve that crispy bite. I accompanied the octopus with simple, light, and crisp ingredients so as to not overpower the star of the dish. I chose Asian pear (another great ingredient to always have on hand to "fancy up" any dish), radish (sliced radishes will also make any dish prettier), and simple greens. The dressing is a simple white wine vinaigrette. Rinse the octopuses under cold water. Add them to a large heavy pot and cover with water by 1 inch. Add the juice from one of the lemon halves, 1 Tbsp white wine vinegar, salt, and the bay leaf. Bring to a boil and then turn down heat to low and simmer until the octopus is fork tender, about 35-40 minutes. Once the octopus is finished simmering, remove them from the water and let them cool. Meanwhile, combine the juice from the other lemon half, 1 Tbsp white wine vinegar, paprika, cayenne, cumin, chili powder, salt, pepper, and 3 slices jalapeño in a bowl and mix well to form the marinade. Marinate the octopus, covered, for at least an hour. Right before serving, brush the top of a grill pan (you can also use a grill basket and actual grill) with olive oil on medium-high heat until the grill is very hot (about 3-5 minutes). Add the octopuses and grill on one side until charred and caramelized. Meanwhile, whisk all the ingredients for the dressing together in a small bowl and set aside. Assemble the salad. 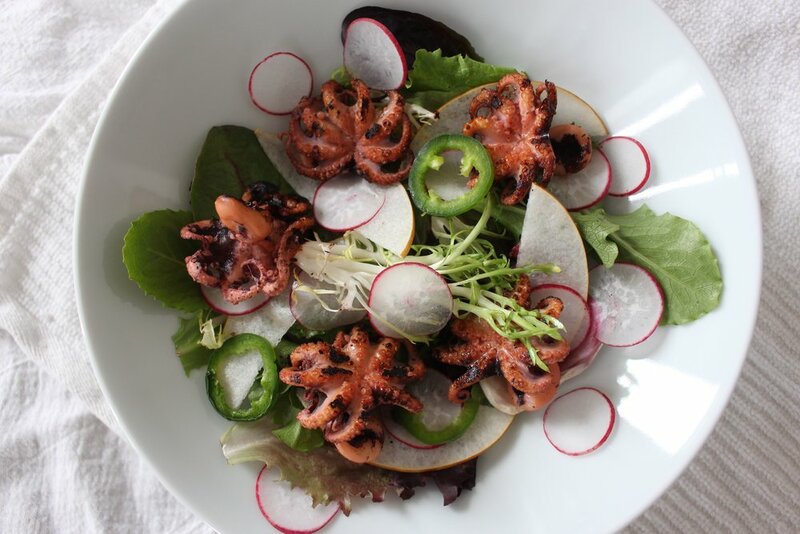 Combine the mixed greens, pear, radish, and jalapeño, and top with the octopuses. Drizzle with dressing and toss to combine.